﻿﻿"Heaven Sent - St. Angela Merici"
This painting was done as a donation for a scholarship fundraiser held by the Ursuline Academy located in Dallas, TX. The work is my interpretation of St. Angela Merici, Founder of the Order of Ursulines in Brescia, Italy circa 1535. ﻿St. Angela is dressed in white representing Purity and Chastity. Around her waist she wears the knotted rope belt made notable by St. Francis and his Order – the 3 knots representing Poverty, Chastity and Obedience. Around her head we see the traditional gold halo that signifies her status as a Saint according to the Catholic Church. In her left hand we find St. Angela supporting a staff that represents Pilgrimage and the many travels she experienced during her lifetime. The staff is topped with a Crucifix, the style of which can also be attributed to the Franciscan Order. In her right hand she carries a book (Bible) demonstrating her love for learning and for her dedication to the education of others. 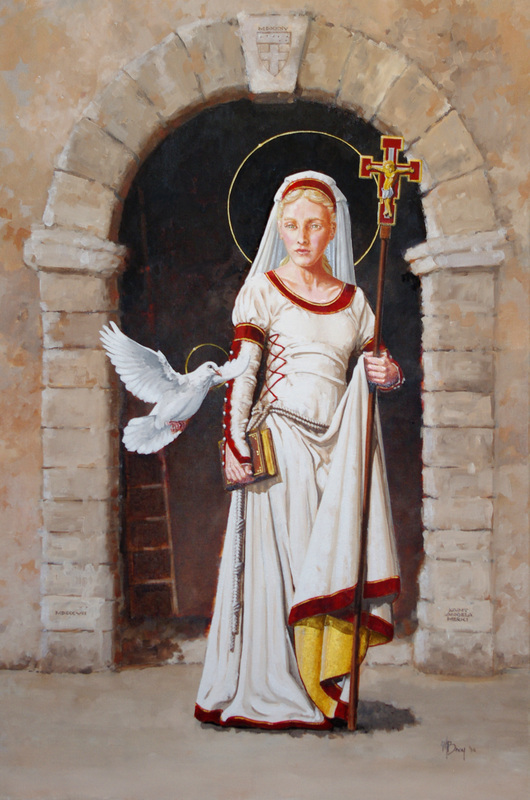 St. Angela was known for her ability to educate and spread the word of God simultaneously. Inside the ruins behind St. Angela is a ladder – the ladder represents one of her most prominent visions that ultimately led her to found the Order of Ursulines. The Keystone in the Arch, above her head, contains a tribute to the Ursuline Academy and to St. Ursula – the constellation of the “Little Bear” or “Ursa Minor” – after which Ursula was named.